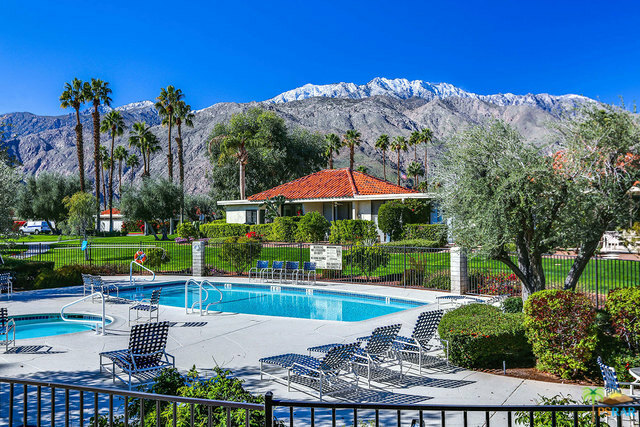 Imagine yourself living in central Palm Springs, in a condo with amazing views, newly redone kitchen and baths, a private laundry area, and a garage. The well designed floor plan allows for good separation between the master and guest bedroom. The kitchen opens to the dining / living area, which in turn opens to the West facing patio offering incredible mountain views. This lovely condo is located at Sunrise Alejo, a quaint community of 108 homes surrounded by manicured landscapes, fruit trees, 3 pools and 3 spas, as well as 2 tennis courts. The HOA covers the building exterior, landscaping, roofs, as well as earthquake insurance. This is located on FEE LAND / YOU OWN THE LAND. Contact agent for a private showing.